We love our dogs immensely, but sometimes we don’t love the shedding that comes along with them. Some of the most popular breeds (like a corgi) are some of the most susceptible to shedding. While adorable, our allergies can only handle so much. In this article, we’ll discuss the factors you should consider before buying a dog deshedding tool, and tips for choosing the best dog deshedding tool for your needs. Are you going mad about how much your dog sheds? Do you want to help them shed peacefully without interrupting the allergies in your home? If so, you may want to check out a dog deshedding tool. In fact, the more you use a dog deshedding tool, the less they shed all over your home because you’re being proactive. With that being said, the tools you find shouldn’t be used on the dog constantly, and you should get on the recommended schedule, which we will discuss in the tips section. You should know that shedding is completely normal, and you should never try anything wacky to help stop it. 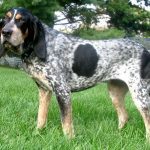 Don’t give your dog a type of food that’s supposed to “cure” shedding, and don’t put any scammy topical products on them to reduce the amount they shed. Dogs naturally have to shed in order for new fur to grow in. When you stump this growth, the follicles can become irritated, itchy, and even infected. One factor you should consider before buying a dog deshedding tool is the type of fur your pet has. There are tools that are meant for heavier coats and getting out all of those tangles, while there are others that are meant for smaller “lap dogs” with thin, close to the skin coats. In knowing which to get, you can reduce the amount of pain or irritation a dog may feel when you’re deshedding them. For instances, using a deshedding tool for heavy coats on something like a Chihuahua may actually hurt them more than help them. Let’s discuss the basics of brushing your fur baby. Wide-toothed combs: these are typically made of metal or plastic and have the infamous wide spaces between each of the teeth. These are fantastic brushes for cats, and they require a bit more pressure. Even though they’re meant for cats, they provide a more gentle experience that can be used on the more fragile puppy. Slicker brushes: a brush like this has a head that’s rectangular shaped, and have metal tines that are extremely fine. If you have a dog that has long and dense fur, then you should look towards the slicker brush. These are specifically meant for the legs, face, tail, toes, and the overall coat of the dense, long hair, and they’re fantastic for removing tangles without ruining the coat or hurting the dog. Rubber brushes: The tines on these brushes are made of rubber, but they come in various shapes and colors for aesthetics purposes. Rubber brushes are fantastic for short-haired dogs, and helping them loosen the dirt or fur in their coat. These are also great for encouraging better circulation. Rubber brushes are also fantastic for loosening hair that is starting to shed. Blade on a handle combs: these combs are typically metal, and one of the newer types of deshedding tools. You may see them listed as the brands Furminator or FurBuster. Those that have medium coated dogs or those that are a bit more plush (without the denseness) should consider using this type of dog brush. Because of the narrow teeth, they seek out the undercoat and don’t ruin the overcoat. If the overcoat of your dog is extremely hard to handle, don’t even think about using this kind of comb. Bristle brushes: a bristle brush is one that’s made of either natural or synthetic bristles, and is pretty basic in the design. 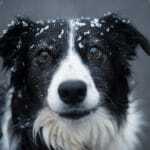 While basic, they are quite versatile and work for dogs and cats with all types of coats. 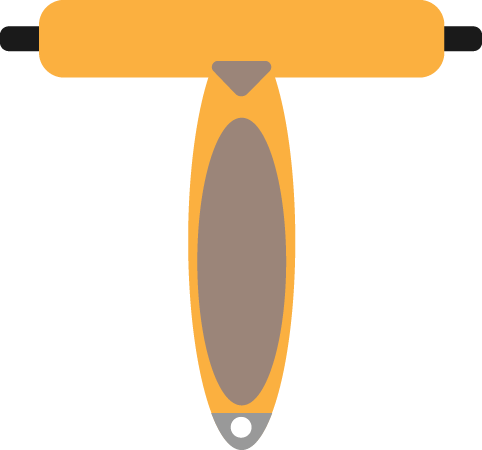 Pin brushes: While the shape of a pin brush is similar to a bristle brush, they are made with pins instead of the typical natural or synthetic bristles. Sometimes these pins are composed of wood or metal. These are mostly seen used on medium coat dogs as well as long haired dogs for the release of tangles. When you’ve finally selected the best dog shedding tool you can find, you’ll probably want to know how much you should actually use this device. If you overuse this tool, your puppy may be susceptible to hair falling out more, or their fur getting tangled more easily. For maximum effectiveness, you should only use this tool one or two times a week, for 20 minutes at most. During heavier shedding seasons, you may want to use a deshedding tool a bit more than you regularly would, but do not increase the duration of the session along with increasing how many sessions you’re providing them with. Only deshed them one or two times more per week. At the end of the deshedding session, your dog’s fur should be tangle free, as well as mat free. Using a brush that doesn’t work with the coat of your dog will only further tangle and reduce them shedding – which is never a good thing. Having a tangled coat is extremely uncomfortable, and you should always brush them with the proper brush. You’d never want to hurt the integrity of their coat, their skin, or cause them to get tangles even further – even if it means dealing with shedding. Those that have a dog that sheds like crazy may want to invest in more than one type of deshedding tool and get into a healthy routine that your dog will enjoy. 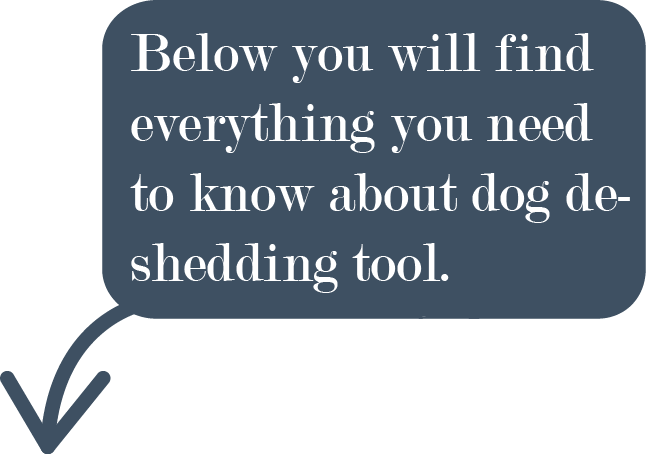 Before we head off into the best deshedding tools for your dog, we’ll give you four quick tips. Brush regularly – as we’ve mentioned, getting on a schedule is important. Brushes one to two times a week for no more than 20 minutes is pretty standard, but depending on your dog’s coat, it may require more weekly sessions. Brushing regularly helps your dog’s coat manage shedding. The longer the coat, the more brushings a week they may need. Short and medium length coats may only need one or two brushings a week. Avoid brush burn – this is extremely important in keeping your dog happy with brushes and deshedding tools. Pups need gentle care and pressing the bristles of the brush too hard against the skin or pulling knots and tangles will give them the uncomfortable brush burn. You should never brush whiskers, moles, or warts. 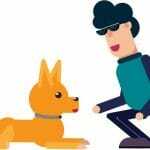 Bath time and brushing – bathing your dog once a week may help soften the coat to ensure the best grooming session and maximum effectiveness with brushing the coat. Dogs don’t need baths often, but a minor bath once a week when brushing may be a good idea. 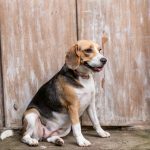 Calming the coat – those that aren’t grooming post-bath to help relax the coat, there are things you can do in order to calm the coat. There are coat sprays that reduce the amount of static cling that a dog has when you bring the brush over their coat. Furthermore, it softens the coat, and there are leave-in conditioners that can help with this. In doing so, this ensures that the coat is workable and reduces the amount of brush burn a dog may get from reducing tangles and general brushing. First on our list is a fantastic product that your pet will absolutely ADORE. What dog doesn’t love pets and pats? Now, you can use that time to actually accomplish something while giving them something they love and feel comfortable with. 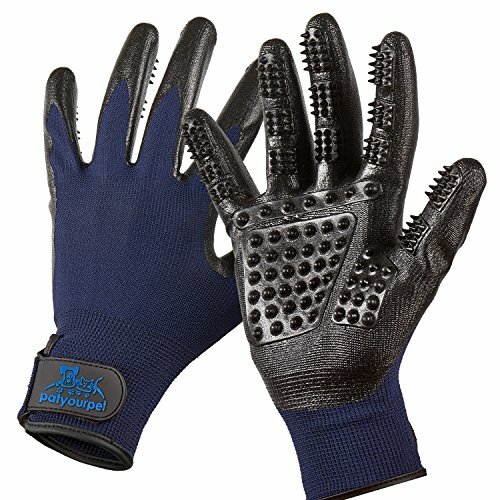 This best-selling product is inexpensive and features an enhanced five finger design that’s for both dogs and cats, as well as long and short fur. This gentle de-shedding tool is great for reducing the amount your pet sheds around the house. You can use both hands at once, and reduce the session time, while being able to groom the dog with ease. If you don’t get rid of that mess of a coat, you can get your money back with no problem. You’re able to use this product wet or dry, and it’s one of the better products to use wet, as there are no bristles to get caught in tangles or condensed fur. Comfortable for your pet to receive a grooming session from – who doesn’t love pets and pats? If you have a big boy that you have to help deshed, you may want to look into this Furminator long hair deshedding tool. This product is great for dogs that weight between 51 and 90 pounds, although, if the coat is bad enough, this could probably used for those that are a little smaller. You’re able to reduce the amount your dog sheds by up to 90%, and you’ll be able to reap the benefits of a durable and strong stainless steel edge that ensures you’re getting beneath the top coat. In doing so, you’ll be able to remove loose hair with ease and further reduce the amount of shedding that occurs with your puppy. There is a button called the FURjector that pushes out the loose hair on the device and cleans it without doing anything else. Furthermore, you won’t have to worry about your carpal tunnel acting up too much, as there’s an ergonomic handle that comes in handy. Next on our list is this fantastic tool that’s quite versatile, despite the small structure. With claims that this product reduces shedding up to 95%, while being able to complete the brushing process in 10 minutes, you won’t have to worry about overusing on your dog. In using this in a routine manner, you’ll be able to reduce the dog’s shedding so much, you can keep the household allergies at bay and not worry about sneezing or waking up with a swollen throat. 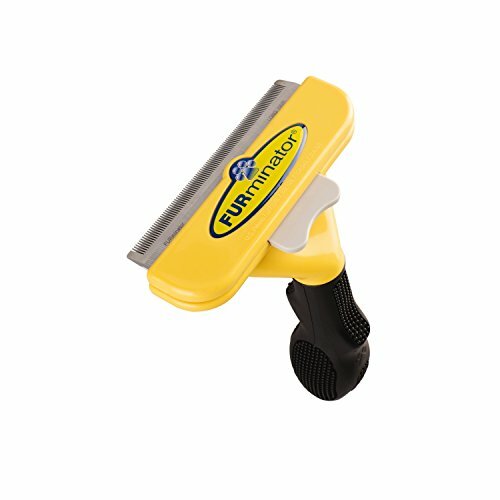 The blade of this product is four inches wide, and works well on those that have short coats, and even longer coats. It reduces brush burn, as well, so you don’t have to worry an incredible amount about harming your pet. Another product aimed towards medium to long coats, this deshedding tool is a monster for those medium to large sized dogs that have an equally as large coat. An extremely inexpensive product, the curved teeth of this stainless-steel tool are meant to penetrate far beyond the top layer of the coat and grab at that loose hair (without being painful) and getting deep in there. There are smoother round edges that ensures a massaging feeling for the dog as you deshed them. For the fur-parent, there’s an ergonomic handle that has a non-slip handle for comfort as you really get in there. Beyond deshedding, you’re able to demat and detangle the hair with ease. Reduce your pet’s shedding with ease as you use this tool that measures 4-inches by 5-inches. Great for larger dogs, and dramatically reduces the amount of shedding that you’ll see, you’ll be able to reduce allergies in your household, as well. 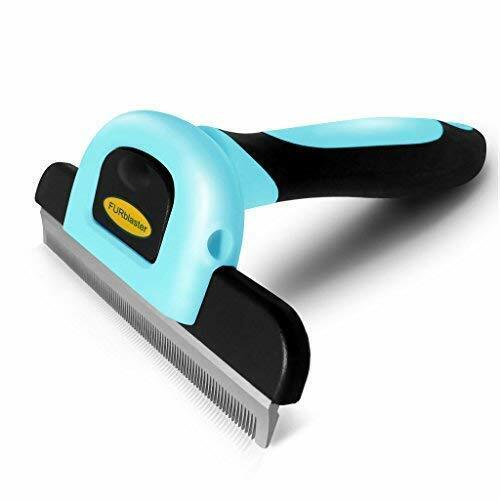 This product is said to have been recommended by veterinarians and groomers, as well as other pet professionals because of the ease of use and ergonomic aspect while reducing the amount a dog sheds. 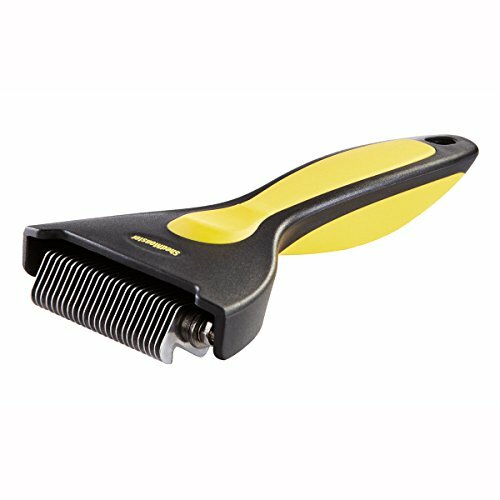 This grooming device features a stainless-steel edge that’s four inches, with teeth that are distributed in a uniform manner. You’ll be able to remove the undercoat of hair that’s ready to go and make way for new fur. Composed of eco-friendly material and coming with a detachable comb head, there’s no way you shouldn’t use this product! There are many fantastic options on this list, and there are some more meant for specific hair types than not. 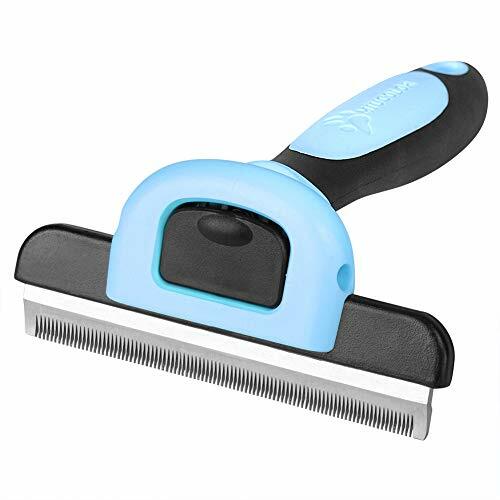 If you’re still unsure of which type of deshedding tool to get, you should seriously consider the DAKPET Dog Brush (that can also be used on cat coats). They are fantastic for all lengths of fur, and it’s available in multiple shades. If this product doesn’t work for you, there’s always a money-back option, and this tool can even help reduce shedding by up to 95%. You won’t need anymore than 10 minutes to begin and finish using this tool – so what are you waiting for? The price is unbeatable!